I love stripes...Either painted on a wall or on a piece of furniture, they are such a super-easy way to make a big impact in a room. I decided it had been way too long since I've done a "stripe project" and was ready to break out the painter's tape again. First, I smoothed out the previous finish with sandpaper and applied two coats of Paris Grey to the frame. One tip that I use with Chalk Paint® is dipping the tip of my paintbrush in water when applying the second coat. It helps to really even out the paint, minimize brush strokes, and save on paint and sanding time. After completing the frame, I measured the width of the three drawers and divided by nine since I wanted three stripes per drawer. After marking my stripes lightly with a pencil, I taped off the sections for painting, alternating between Paris Grey and Pure White. After the painting was completed, I simply added a coat of Clear, Soft Wax and buffed to a shine. I'm lovin' how this one turned out...hmm, I wish I had a spot to keep this one! This dresser, the boxes, and a few other pieces that I painted up this last week are off to my booth tomorrow! Disclosure: I was selected for this opportunity from Annie Sloan Unfolded and graciously received the paint and companion products to complete this project. The content and opinions expressed here are all my own. Soo cute. I have never done stripes, you make it sound so easy. I may have to try it know. Thank you. Very pretty, love the glass knobs! Very pretty, Kristen! Love the color combo and the stripes. I like to do stripes to change things up a bit, too. Sometimes a piece calls out for "something". Beautiful makeover and I love the HB knobs (gotta get some of those). 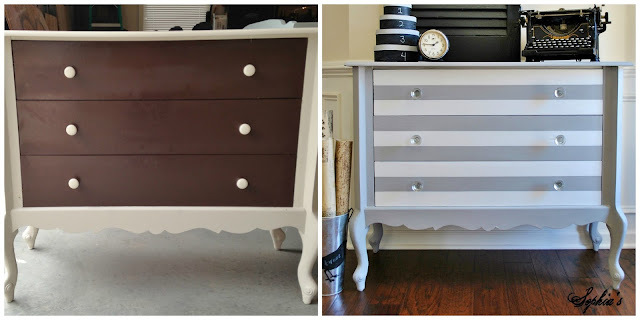 love the shape of this dresser and the way you've transformed it is beautiful as always!! Yay!! !...congrats on being chosen for Annie Sloan's Unfolded! !...so well deserved Kristen! !...Love the striped chest...it is such a beautiful transformation! !...I think someone will be there waiting for you to deliver that beauty!! Absolutely beautiful! It would look stunning here. :) You are very talented in doing the stripes. Love the typewriter too! You sold me. I am a fan and follower. I have to say how much I admire your talent. You just seem to know what a piece needs to bring out the best. Lucky furniture you transform. I think I'm too impatient, want the change right away but after seeing how you make such a difference you might just have influenced my patience to take hold if I want a piece to look as it could. You've really inspired me. So glad I found your blog. Happy Spring. I am so proud of you for being chosen for Annie Sloan Unfolded. You deserve it! I love this dresser and love the stripes, but the hardware had me at hello! It is probably better that I don't live near a Hobby Lobby. Dang it! Always looking forward to your next makeover. You really are so talented and have such phenomenal taste. P.S. Thanks for the shout-out! Visiting from "Open House Party Thursday at No Minimalist. Great job. I love stripes and you chose a nice mix of color. Very modern and rich. Thanks for your post. Debbie from "One Day at a Time"
Hi Kristen, I've never done stipes but you make me want to try! I'm a new follower, love your blog. Love your stripey dresser! And I esp. love those knobs! Love the stripes! I've been wanting to try them on something! The knobs are pretty fantastic, too. We just got a Hobby Lobby in our area so I'm pretty excited to check out what they have. Looks great--love those knobs, what a great find! Love those stripes! You did a beautiful job. And Annie Sloan Unfolded. I am so excited for you. You definitely deserve this. Those knobs are amazing. I'm going to have to hunt for some in the bins at my Hobby Lobby. And is that a Silhouette project I spy on the bucket? Looking forward to seeing you again soon for High Point & From Downtown to Downton. Kristen the dresser looks so fresh and clean. What a nice job. I love it.Thanks for sharing and all the info. Hi Kristen! I recently featured a pic with this striped dresser, on a post, on my blog! Off course I attached a link to your blog, I hope you don't mind!